Kars - Erics - Pathos - 2initineres Webseite! We left Kars with a view to the fresh snow on the mountain tips. During the night it had been raining in Kars. Reading in the newspaper about the heatwave in Switzerland we hardly can imagine how that feels. One of our additional loops to spend the spare time brings us to the Van lake. This lake is 7x bigger than the Bodensee and it does not have any drain. The incoming water coming from the mountains during springtime evaporates in the summer months. We stay overnight in a nice hotel. For once we enjoy Gin and tonic as apero and wine for dinner. What a pleasure, the biking next day was much easier. 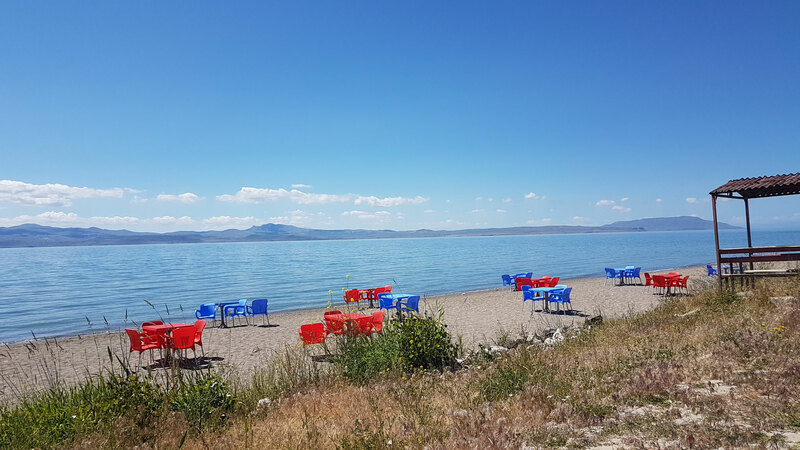 We are passing the towns Horasan, Ağri and Patnos and finally arrive in Erciş at the Van lake. On the way there nothing spectacular happens. We bike and enjoy the nice wild flower fields, pass many small farmer villages, we wave back to car- and trucks-drivers giving signs to us. Only construction works on the road worry us. Sometimes the street get that narrow that trucks can’t pass us. Whenever possible we started to move to the side that is under construction. It is easier and stress free to drive there without traffic, even though there are more bumps. At least we have thought so, until we unexpectedly got passed by a truck with a higher speed than on the normal road. A bit frightened we continued on the side of the track. On the fifth day we arrived in Erciş. The hotel was located a bit outside of town so we decided to cross the town for some sight seeing before arriving there. In the Center there was the market and many people on the street. When we stopped we are surrounded by people asking us where we come from, age, name and and and. Quite often they wanted to help us, even by calling a friend that speaks English and then handing over the telephone to Markus. The person then asked: how can I help you? Do you have any problems? What a nice gesture! Finally we arrive at the big hotel close to the lake. Here we want to spend 2 days just hanging around. After our siesta we were hungry and therefore looking for the hotel restaurant. On the 8th floor where the restaurant should be we only found a huge empty hall. Down at the reception we got the information that due to the Ramadan the restaurant was closed. Our intervention that we always got food even during Ramadan did not help. They suggest we should buy some food in the supermarket or wait to get a hamburger in the restaurant near by. We decide for the supermarket and bought some cheese, dry meat, bread and some cookies. We upgraded the “dinner” with some red wine that we get in the hotel. Anyway the next morning we got breakfast, even though we had to ask for bread, tomatoes & cucumbers, napkins, tea and and. Would we have had a car we would have driven to Van, but with the bike 100km is a lot, especially when you have to go forth and back. Shortly before we arrived in Erciş we were informed by another touristler (Turkish for tourist) that travelled with a camper, that the street to from Caldiran to Dogubayazit was closed on short notice. That was actually the route we had planned to take to get to Dogubayazit. For us that means riding back 2 stages to Agri and then forward to Dogubayazit. We’ve got enough time but it is strange to do the same way twice. We spend our two days at the lake and make the best out of it. The service in the hotel was really lousy, they found even an excuse why they did not need to clean the room 😆. The next day we drove back to Patnos, it was nice and warm. On the way we had to pass a check point where for the first time we got stopped by a control post and had to show our papers. We gave our identification card and a special entry paper we have received a the border when entering Turkey. The firs person let us pass, but the second one wanted to see a passport with visa. How do you explain to an official that we do not need a passport nor a visa. We had to wait while he was very busy on the telephone. After a while we had to follow him around the corner. There it got very familiar, we received tea and cold drinks. At the end we got told everything was ok and we even received a Turkish paper that explains that we do not need passports. Meanwhile all the crew from the checkpoint was gathered and enjoyed a break with us. As usual we finalised the “meeting” with a group photo before we left.